Business name generators can save you time and reduce stress when you are starting a new business or brand online. I’ve started over 100 websites as side projects over the last 15 years. Like many others, the biggest thing I’ve had a problem with is coming up with a business name. Whether it is just a blog, a tech startup, an affiliate website or a business site, coming up with a name is always difficult. I’ve spent countless hours coming up with names before only to find that the domain isn’t available. There are a lot of different name generators out on the web and I’d love to break them all down but while doing research for this post I came across a great breakdown of name generators. There are many components that go into creating a good website or blog, but one of the most important – and sometimes overlooked – factors is having a good domain name. Something that fits well with your business name and purpose, something that’s memorable and not prone to misspelling, and something that taps into your targeted keywords to enhance your SEO efforts. You can spend hours brainstorming the right business, website or blog name, but there are some great tools available online to give you a huge range of suitable options in a snap. Business name generators are not a new concept, and there are tons available. Although, not all are high quality. I wanted to put a bunch to the test and give you the skinny on some of the tools I thought yielded the best results and proved simple to use. To test the many business name generators I stumbled across online, I imagined myself to be in the business of selling rock band tee-shirts, looking to target and incorporate the keyword term ‘band tee’ for SEO, and because it would most clearly explain my hypothetical business in a nutshell. 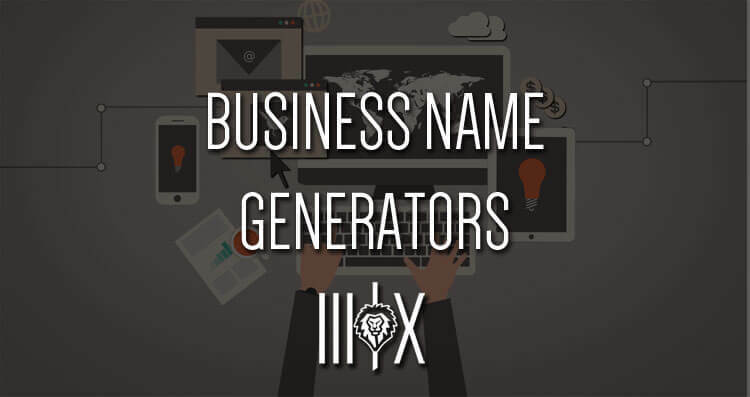 Here are the five best business name generators I recommend trying out for yourself. WordPress’ parent company Automattic recently acquired Lean Domain Search, so it was naturally the first tool I tested, and it set the bar extremely high for all of the other tools that followed. I plugged ‘band tees’ into Lean Domain Search and was presented 4989 available domains. But the sheer number of suggestions wasn’t the only thing that impressed me. Using Lean Domain Search, when you select one of the domains suggested, the site double checks the domain is still available but also checks that the related Twitter name is also available. For example, when I clicked ‘BandTeesPro.com’ I was shown that @BandTeesPro was available on Twitter. I was also directed to register the domain with three popular providers, making the task simple. Another bonus of using Lean Domain Search is that you can browse the list of suggestions on your webpage, or you can copy the entire list to your clipboard with the click of a button and paste it into a document to come back to later. Panabee stands out from the plethora of ugly domain name generators online thanks largely to its attractive, quirky interface, but it also delivers on functionality. Using this tool, you’re presented with a list of .coms and international domains (some of which are already taken, meaning you need to click through to see availability) as well as lists of related terms for each of the words plugged into the system. You’ll also be presented with a brief list of Google AdWords currently targeting those terms (for example, in my testing Panabee displayed a selection of other businesses promoting band tees) to give you an idea of the kind of competition you’ll be facing online. You can change domain extensions, to .biz, .org and more, and when you click a domain name suggestion and you’re automatically directed to GoDaddy, offering further related suggestions and purchasing options. Domainr is slightly different to the other tools I came across, but it has a twist on the domain generator concept that got my attention right away. It doesn’t offer suggestions for related words and a pile of possible domain name options, but it does offer suggestions for domain extensions that can be used to give you a shorter domain, and a point of difference. Enter your targeted words and hit search and Name Mesh offers a selection of common short domains, similar domain suggestions, SEO-focused suggestions, fun suggestions and mix suggestions to help you find a domain name that’s perfect for your business blog or website. Domains are marked red or green to indicate their availability, and you can hide unavailable domains and set a maximum character length in the settings. You can also click a domain option to see its social availability on Facebook and Twitter, and turn additional extensions on and off (such as .com, .io, .co, and .net) to give you more or fewer options. Domains Bot is simple to use with a clean interface. Simply enter your keywords and hit the Search button, then further refine your list by allowing or disallowing synonyms for each of your keywords, selecting which TLD extensions to include, your price range and more. You’ll be presented with a list of available and already-registered domains, and information about social availability for each suggestion. Hit the Buy button next to the suggestion you like and be directed to a list of registered providers and prices. Have a suggestion for a great tool I’ve missed here? Be sure to share it in the comments! I am still working on more research into finding the best business name generator. For now, these are on the list! If you find a name you want and don’t want to waste time, you can register your domain at HostYak. Or if you are wanting to get website hosting as well, you can use InMotion Hosting. Feel free to watch this video if you would like a walkthrough on how you can get hosting and a free domain when you do.